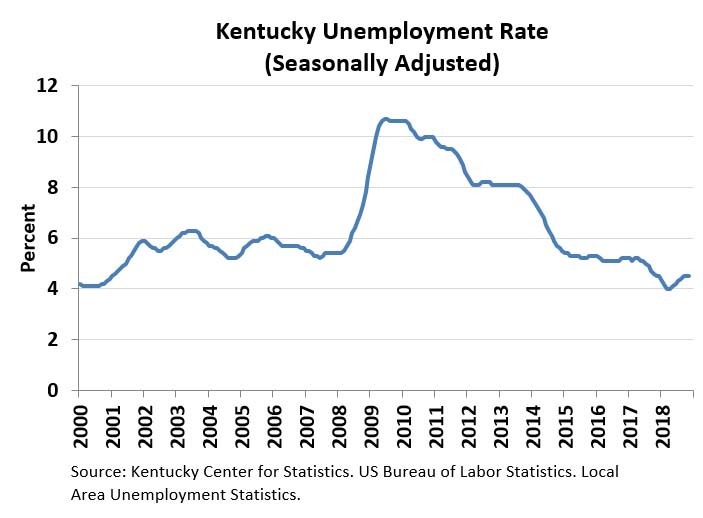 FRANKFORT, Ky. (Jan. 17, 2019) - Kentucky’s seasonally adjusted preliminary December 2018 unemployment rate was 4.4 percent, according to the Kentucky Center for Statistics (KYSTATS), an agency within the Kentucky Education and Workforce Development Cabinet. The unemployment rate for December 2018 was down from the 4.5 percent reported for November 2018. The preliminary December 2018 jobless rate was down 0.1 percentage points from the 4.5 percent recorded for the state in December 2017. The U.S. seasonally adjusted jobless rate for December 2018 was 3.9 percent, up 0.2 percentage points from its November 2018 level, according to the U.S. Department of Labor. Kentucky civilian labor force decreased by 1,584 individuals in December 2018, bringing the state’s labor force to 2,074,067. The number of people employed in December was up by 45, while the number unemployed decreased by 1,629. In a separate federal survey of business establishments that excludes jobs in agriculture and people who are self-employed, Kentucky’s seasonally adjusted nonfarm employment increased by 4,500 jobs in December 2018 compared to November 2018. Kentucky has added 21,300 jobs since December 2017, a 1.1 percent employment growth. Nonfarm data is provided by the Bureau of Labor Statistics’ Current Employment Statistics program. According to this survey, six of Kentucky’s 11 major nonfarm North American Industry Classification System (NAICS) job sectors saw employment increases from the previous month while three declined and two were unchanged. 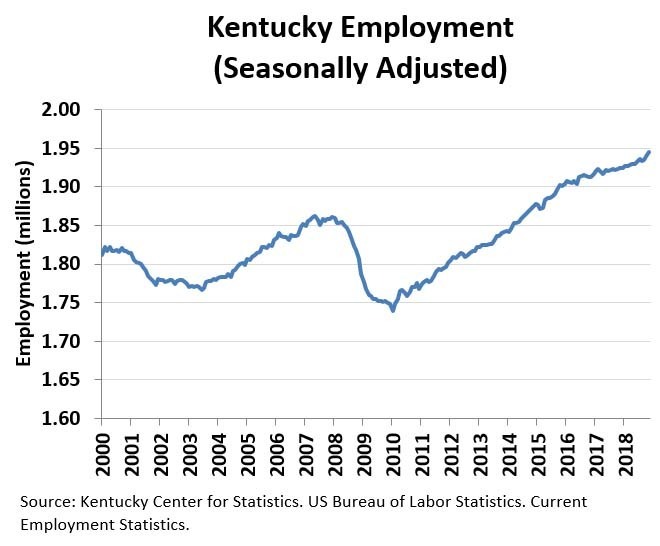 Employment in Kentucky’s professional and business services sector jumped by 2,200 jobs in December 2018 for a gain of 1 percent. This sector is up 6,300 jobs since December 2017. The job gains occurred primarily in the administrative and support and waste management subsector, which rose by 1,800 positions in December. The professional, scientific and technical services subsector rose by 300 jobs and the management of companies subsector added 100 positions. “Employment in professional and business services showed strong growth during the final months of the year, finishing 2.9 percent higher than last year,” said Clark. Construction employment increased 1,600 jobs in December or 2.1 percent. The construction sector is up 2,000 jobs during the past 12 months for a gain of 2.6 percent. Kentucky’s manufacturing sector expanded by 900 jobs from November 2018 to December 2018, a gain of 0.4 percent. The additional jobs occurred entirely within durable goods manufacturing. Kentucky’s manufacturing employment is up by 3,800 jobs since December 2017. Trade, transportation and utilities sector increased by 800 jobs in December 2018. Since December 2017, employment in this sector jumped by 10,300 positions or 2.5 percent. Wholesale trade lost 500 positions in December 2018, while retail trade rose by 1,100 jobs in December. Transportation, warehousing and utilities gained 200 jobs in December 2018. Employment in the educational and health services sector expanded by 700 jobs in December 2018, a gain of 0.3 percent. Employment was up by 400 positions in the health care and social assistance subsector and 300 positions in the educational services subsector. Since last December, the sector has increased by 3,000 positions or 1.1 percent. Employment grew by 300 jobs in the other services sector from November 2018 to December 2018. The other services sector includes repairs and maintenance, personal care services and religious organizations. Employment in this sector is up 300 jobs since December 2017. The financial activities sector was unchanged from November 2018 to December 2018. This sector rose by 1,000 jobs compared to last December, a gain of 1.1 percent. Employment in Kentucky’s mining and logging sector was unchanged in December, but up by 200 positions for the year, a gain of 2 percent. Kentucky’s leisure and hospitality sector fell by 1,300 jobs from November 2018 to December 2018, a decrease of 0.7. This sector is down 4,400 jobs since December 2017. The accommodations and food services subsector lost 1,100 jobs, and the arts, entertainment and recreation subsector declined by 200 positions in December. The government sector recorded 500 fewer jobs in December. Federal government positions decreased by 200, state government positions was unchanged; and local government fell by 300 jobs. Total government employment has declined by 700 jobs since December 2017. Information services sector lost 200 jobs in December 2018. Employment in this sector is down 500 jobs since December 2017, a loss of 2.2 percent. The industries in this sector include traditional publishing as well as software publishing; motion pictures and broadcasting; and telecommunications.